The Priscu Lab has continued to provide opportunities for training and development in microbiology to high school students over the past year. From November 2011 – March 2012, Alex Michaud, a PhD student in the Priscu Lab, mentored Chase Jordan, an 8th grader at the Chief Joseph Middle School in Bozeman, MT in investigating the diversity and abundance of ice nucleation active bacteria. Chase won a blue ribbon, gold medal (first overall), and was nominated for the Broadcom Masters competition at the regional science fair. He will be competing at the Montana state science fair in March 2012. Alex is currently mentoring Sean Erwin, an 8th grader at the Greater Hartford Academy of Math and Science in Hartford, Connecticut, on experimental induction, observation, and quantification of bacterial ice nucleation. Polar outreach work at Montana State University continues to be coordinated by part-time Outreach Coordinator Susan Kelly. The MSU component of the MCM LTER program participated in many Antarctic related outreach activities between 15 April 2011 and 31 March 2012. Susan Kelly and the Priscu lab group developed the Crow Education Partnership with teachers and students on the Crow Indian Reservation (Hardin Intermediate School District, Hardin MT). Priscu Lab graduate students and scientists participate in this monthly program on the reservation, which serves 200 4th grade students and teachers, sharing information about Antarctic science from their experiences working as part of the limnological component of the LTER project. During May 2011, the Priscu lab group sponsored a field trip for more that 100 4th grade students that are part of the Crow Education Partnership, providing an afternoon of hands on activities and a tour of the MSU Subzero facility. Activities led by Priscu lab members included the use of microscopes in microbiology, led by Priscu Lab PhD students Alex Michaud and Tristy Vick, and how animals use blubber to keep warm in polar regions, led by LTER technician Amy Chiuchiolo and Priscu Lab Post-Doctoral Researcher Heather Adams. In March 2012, LTER PhD student Katherina Hell and PhD student Tristy Vick participated in a daylong Student Climate Change Summit and interacted with 60 students and teachers as part of the Crow Education Partnership. LTER scientists conduct regular school visits to local schools. 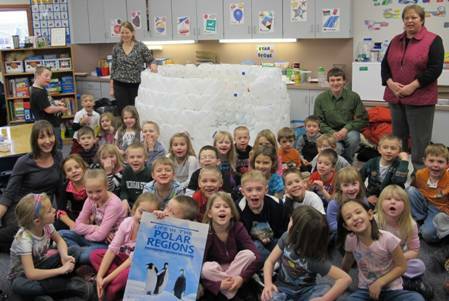 More than 50 Ridgeview Elementary School (Belgrade, MT) students interacted with technician Amy Chiuchiolo and undergraduate student Hayden Wilson in May of 2011 during a visit to talk to students about Antarctica and how people and animals keep warm in such a cold environment. Priscu Lab PhD students Tristy Vick and Alex Michaud interacted with over 250 kindergarten kids again in February 2012 during a visit to talk to students about Antarctica (Figure 6). Amy, Hayden, Alex and Tristy were able to share information about Antarctica from their experiences as field team members for the limnological component of the LTER project. PhD students Tristy Vick and Alex Michaud talk to kindergarten students at the Ridgeview Elementary School in Belgrade, MT about their experiences in Antarctica. In the background is an igloo the students built out of milk jugs prior to the visit. Dr. John Priscu provided a keynote lecture for the Master in Science of Science Education (MSSE) course, Lake Ecology, targeting 30 middle and high school teachers, during July 2011. The Priscu Lab sponsored an activity at the statewide Science Olympiad at Montana State University where over 1000 high school and middle school kid participated in science experiments and competitions during November 2011. LTER technician Amy Chiuchiolo visited a pre-school class at the Community Cooperative Preschool and a first grade class at the Annie L. Sargent Elementary School, both in North Andover, MA during February 2012 (Figure 7). She talked to students about her experiences in Antarctica, and explained how people and animals are able to keep warm in cold environments. 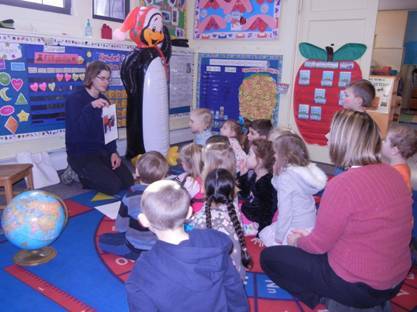 LTER technician Amy Chiuchiolo talks to pre-school students at the Community Cooperative Preschool in North Andover, MA about her experiences in Antarctica. During the past year, Susan Kelly, the Priscu Lab Outreach Coordinator participated in the selection committee for the PolarTREC program, and helped to choose more than 50 teachers that will participate in science research projects at both poles.